Frers Designed First 42 “Tall Mast, Long Keel” TMLK is a world wide contender in racing and per-formance cruising. This one has been under the care of the same owner since 1994! DIMENSIONS: LOA: 42, LWL 39’ 8” Beam 12’ 8” Draft 7’ (Lead Keel) Displacement, 18,700 as designed Mast Height Off Water: 59’ 2” Hull Topsides Painted 2009 Dark Blue Awlgrip, White boot Stripe. Decks Renovated and Painted 2016. Inside, the hull sides and cabin top are insulated with 1/2” marine grade foam. ENGINES AND MECHANICAL: Perkins 4.108 with 4,200 hours (Engine Hours Meter Installed - Upgrade ! ) ZF Transmission 12M (2017) with <150 hours (2017)Injection Pump (2012) Exhaust System Replaced 2009 From Exhaust Elbow to Transom. FUEL: Primary - 40 gallon stainless steel tank. Aux: 15 Gal (2013)	Racor 500 Primary + CAV (final). 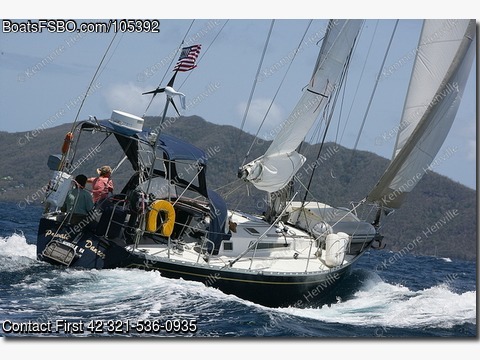 SAILS AND RIGGING: Main: 397 ft2, 9.65 High Aspect Dacron, 4 Battens, 3 Reefs (June05)	Above Avg JIB: 130% (415 ft2) RF Jib w/ Padded Luff - Primary Working Jib	Average JIB	90% (375 ft2) RF Jib (primary heavy weather jib)	Average JIB	9’ Storm Jib	Above Avg Drifter	Approx. 1 oz Dacron (RF)	Above Avg Spinnaker, Cruising .75 oz Dacron with dousing sleeve.Above Avg STANDING RIGGING: Isomat Keel Stepped Tapered Spar with Dual Air Foil Spreaders Isomat Boom with 3 reefs (hard eyes) and out haul. Renovated and Upgraded 2006 16’ Spinnaker Pole Uppers, ( 3/8 )Intermediates ( 5/16 ) and Lowers ( 3/8 ) Baby Stay Running Backstays Upper terminations are swaged, lowers are Sta-Lok. Roller Furling Forestay (wire) and Foil replaced (2012) (Harken) Hydraulic Backstay Tensioner and Boom Vang (Harken) Chain Plate and Struts Assembly, Replaced and Upgraded 2012. SAILING WINCHES: (All Lewmar) 2) Primary Jib Sheet “48 Two Speed ST” 2) Spinnaker Sheets “55 “ Three Speed Non ST” 1) Main Halyard	“44 Two Speed ST” * (1995) 1) Main Sheet	“44 Two Speed ST” * (2012) 2) Traveller Control	“40 Two Speed Non ST” 2) Foredeck	“40 Two Speed Non ST” 1) Boom Outhaul and Reefing“40 Two Speed Non ST” * Upgrades. COCKPIT and STEERING: All Cockpit Wood (Seating and Grating) replaced in 2006. Steering Cables Replaced 1995 and 2013. Autopilot Raymarine Type 2 with Corepak (2004) Folding Teak Cockpit Table Refinished 2018. (Removed during winter). INTERIOR: - *Main upgrade are Teak and Mahogany custom drawers in both heads and aft cabin! Sleeps 7 to 8, two heads - all renovated and upgraded. Main Salon Sleeps 4 in Settees and Lee Berths. Cushions and beds recovered in 2011. Forward Double berth with separate head (upgraded SS sink, counter, mahogany drawers, lighting) Aft Cabin Sleeps 1-2, Upgrades include: Teak Shelving and Custom Teak and Mahogany drawers. Aft Head with Custom Teak and Mahogany drawers., upgraded SS sink, renovated counter and bulkheads. Galley with double SS sink, upgraded counters and custom top loading air cooled 12 VDC Fridge/Freezer. Unit is fitted with an Hours Meter to keep track of run time versus amp-hours con-sumed. Flooring throughout has been reinforced and recovered in simulated teak and holly laminate. Lami-nate is much harder than natural wood surface and is considered an upgrade. A/C: Interior maintained at a cool, dry comfortable air conditioned temperature by a powerful 16,000 BTU Cruise-Air A/C. Insulation: (Important Feature) Inside hull (behind mahogany panelling) and underside of deck has been insulated with 1/2” marine grade foam. V Berth insulation is cast in place foam and is approx.-1” thick. ELECTRICAL: Xantrex 3000 Watt Inverter Charger (Upgraded 2013) with System Control Panel (SCP). House Batteries: Two, 8-D Gel Cells (Upgraded 2014), Total 880 Amp Hours. Isolated by House Batt Switch. Engine Start: Group 24, dual 800 CCA, Isolated by Start Battery Switch (with cross connect). Balmar Dual Output 90 Amp Alternator. Digital Volt Meters for Shore Power and Start Battery Voltage. Dual double insulated 30 amp shore power circuits run in #8 wire through conduit (double insulated). ELECTRONICS and NAVIGATION FURUNO GP 33 GPS at Helm with remote USB feed to Nav Station (2013). RITCHIE Globemaster Compass (2011 Upgrade). VHF - ICOM M504A (2013 Upgrade) SSB ICOM M802 with AT140 Tuner (2013 Upgrade) Hornet 4 (New) and Hecta Sailing Instruments (B and G) at Nav Station with 6 cockpit repeaters, (New liquid crystals). Anchoring and Nav Lights, Steaming Light, Deck Light. Stereo AM FM CD (2018) ANCHORING and DOCKING Lighthouse 1501 Stainless Steel Windlass (Top of Line Upgrade) Foot switch+ Helm Switch Starboard Rode (Primary): 200’ 5/16” G4 High Tensile Galv. Chain and 40lb Bruce Port Rode: 40’ 5/16” G4 Chain, 275’ 3/4” 3-Strand Nylon and 20lb Fortress. #3 Rode: 20’ 5/16” G4 Chain + 150’ 3/4” 3 Strand Nylon and 40lb Bruce. Inflatable Fenders, Braided Mooring Lines w/Chafe Protection. CANVAS Full Bimini (2015) Sunbrella Dodger (2017) Sunbrella Connector (Stamoid) Sun Awning (Bow) Stamoid Hatch Covers For Main Hatches(Insulated) and Side Windows (Stamoid). PLUMBING and TANKS: Fresh Water: Upgraded, two 50 gallon nylon covered vinyl (2014) Waste: 20 gallon Vetus. SAFETY: Hand Rails: Custom Stainless Steel Hand Rails on Dodger. ! Jack Lines 1” Tubular Nylon Webbing (New) EPIRB Global Fix RLB-35 CATII 406 MHz MOB Pole,	16’ with Strobe Throwables	LIFESLING Retrieval System and Horseshoe Lifelines (2012) 8mm, 7x19. (2012) PFD’s, Six, Type 2, Unused, New Condition Fire Protection	5lb CO2 (Recert Jan2019), 3lb Dry Chem LPG Sensor	CO Sensor	Smoke Sensor. TENDER: Zodiac 9.9 RIB, Fiberglass Bottom, Custom Sunbrella Cover, Custom Fuel Tank Platform with Johnson 15 HP (Carb Rebuild 2018,) Runs great 25 kts.Paddles, Fire Extinguisher & Anchor.